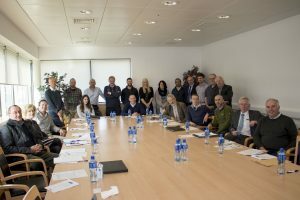 In mid-October 2016, the MOREFISH team hosted some of Ireland’s largest fish producers for a day of talks by international and Irish experts in the area of aquaculture. The day opened with MOREFISH Principal Investigators Dr. Eoghan Clifford and Professor Neil Rowan welcoming the 20+ attendants. The first session of the day consisted of the MOREFISH team introducing the attendants to their research. Conor Behan introduced his performance assessment index which allows farm operators to account inputs and outputs. Dr. Alexandre Tahar spoke on water quality within fish farms and the discharges. Alan Kennedy spoke on his work developing novel aeration technologies for the Irish aquaculture sector. Sarah Naughton showcased her work on the use of Pulsed Ultraviolet disinfectant technologies and the elimination of certain problematic pathogens using this technology. The final MOREFISH speaker on the day was Ronan Cooney who presented some of the teams work on reviewing discharge licenses and the disparity between and within issuing authorities, he also presented an overview of his work on developing a biodiversity impact metric in the use of lifecycle assessment. The keynote speaker on the day was Dr. Jean Paul Blancheton. Dr. Blancheton is a senior research scientist with IFREMER, the French marine research institute. Dr. Blancheton was lead scientist on a recent project called OrAqua, which looked at the promotion of organic practices in aquaculture and gauging the consumers’ perception of what organic means (www.oraqua.eu). Irish speakers on the day included Martin Flanigan from the Aquaculture Initiative who spoke about the experiences of Northern Irish aquaculture with regards to discharge and abstraction rate. Damien Toner from Bord Iascaigh Mhara, gave an overview of the pressures facing freshwater aquaculture and an exciting new project by BIM called PeatAqua. Dr. Neil Bass of Watermark gave a very interesting talk on the Water Framework Directive and its application to the freshwater aquaculture sector and postulated that the future of Irish aquaculture may lie in lake culture and recirculating aquaculture systems (RAS). During the roundtable discussion there was positive feedback from the industry members present for the work completed by MOREFISH to date. The issue which was of greatest concern to the industry was the continuing uncertainty and delay in the issuance of aquaculture licenses. It was agreed that MOREFISH would become a platform to facilitate the freshwater fish farmers of Ireland at meetings going forward.